So [the prodigal son] got up and went to his father. The struggle of parental control and rebellious children is as old as humanity itself and common to even the best of families. The particulars vary as well as the severity, but the path of fierce (and often foolish) independence is well trod by masses of young people escaping the tight grip of smothering (and often foolish) control. 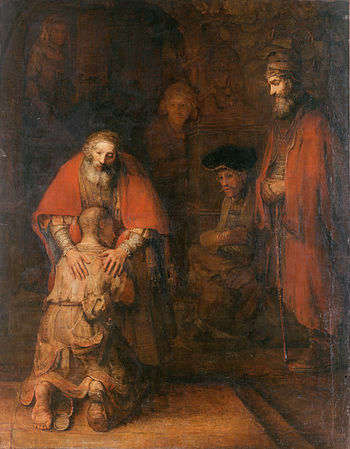 It was while I was a young man working with youth that I first observed the fact that the prodigal’s Father did not go after his son. He didn’t spend a fortune chasing after the boy. He didn’t hire private detectives in the distant country to apprise him of his wasteful son’s dealings and whereabouts. He didn’t go chasing after the kid, confronting him, recounting the boy’s many poor choices and providing him with an itemized statement of all the pains and worry he’d caused. He didn’t seek out his son and demand that the boy return. The father stayed home and let his son fail. He let his son squander the money and learn first hand what it is to be in need. He let the boy make terrible, self-seeking friends and learn just how trustworthy those types of friends are. He let his son go hungry and stand in pig slop until even the livestock feed began to appeal to him. Sometimes children need to runaway. It’s part of their journeys and their stories. It teaches them priceless lessons that parents can never provide and their children will never hear. But that does not mean the father was uncaring or unconcerned. In Jesus story, the father sees his son coming from a distance. The father had been watching. The father had been waiting. The father’s eyes had, countless times, turned up the road from the homestead – each glance hoping to catch sight of his lost son coming home. Jesus story was intended to illustrate Father God’s attitude towards foolish sinners who make tragic life mistakes. Foolish sinners like me. God has been so patient, gracious and forgiving with me in my foolhardy trips (more than one) to distant countries to squander what I’d been given. It would be hypocritical of me not to afford my own children the grace that Father God has showered me, one of His many prodigal.